Want to find out a bit more about Adventure Life? 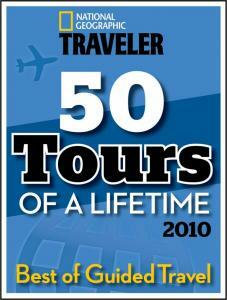 Check out some of these great publications that have written articles about our tours. Browse through these brief summaries or click on the links below to read the full articles! Adventure Life's Bolivia Backroads + Oruro Festival trip was selected by National Geographic Traveler as one of their Tours of a Lifetime. Truly a unique and special trip, we're so please with the feature. We're traveling again. Tour operators are reporting big spikes in inquiries and bookings. But an uncertain economy, ongoing wars, and the fragile health of the planet have, perhaps permanently, reordered priorities. Travelers now seek more perspective, meaning, and challenge. They want to see the unvarnished reality of a place, not just the fantasy. Outfitters have responded by dialing down the luxury and refocusing on core offerings. Their itineraries are more innovative and experiential—aimed at developing lasting connections between people. Here are 50 of the world's best guided tours for 2010, as chosen by the editors of National Geographic Traveler magazine. Outside Magazine features Adventure Life in their Falklands Island adventure! A great read. Check out a snip below or click here to read the whole article. ...Montana-based Adventure Life offers three new land-based itineraries. Their popular Wildlife Week gives you eight days to get among seabirds, penguins, albatrosses, sea lions, and other interesting creatures on Sea Lion, Saunders and East Falklands Islands. The eight-day Falkland Island Life offers a mash-up of islands wildlife, history and culture on East Falkland, West Falkland and Sea Lion islands..."
We are so pleased to have our Peru Service Project trip featured in National Geographic Adventure's Best New Trips issue! Read a short highlight below, or click on the link to read the entire feature. "Long before the term "voluntourism" became etched into the travel lexicon, Adventure Life Journeys was a model practitioner. For years, the Latin America–focused outfitter has made a point of incorporating meaningful volunteer work into each of its itineraries and employing local guides and lodge owners. Now comes perhaps its most compelling offering: a weeklong stay with Inca descendants in the Sacred Valley village of Cachiccata, followed by a trek to Machu Picchu..."
...By the way, when researching hotels for this or any other trip, don't forget to check package deals offered by airlines, hotels and tour operators. You can sometimes save quite a bit. For example, Adventure Life, a Montana-based tour operator specializing in Central and South American eco-trips, offers a variety of air-hotel deals that beat the cost of booking the components separately, and the company will customize its packages to suit your schedule. Outside Magazine declares what I've long known as true - Adventure Life is one of the nation's Best Places to Work! We are honored. Family Affair: This international-travel outfitter's home is a modified flat that feels like, well, a home. Attire is decidedly casual (it's Montana), and parents can even set up a playpen next to their desks. "Going to the office and seeing my colleagues actually improves my day," says Brian Morgan, Adventure's founder and president. All employees can opt for compressed four-day workweeks and, once a year, take a free Adventure Life trip -- with a family member or friend to make sure it really feels like vacation. "These 30 companies share a common belief: that the secret to success in any economy is empowering employees to live balanced lives and remain committed to their communities and the environment," said Michael Roberts, Executive Editor of Outside. "Our winners know that happy workers are good for the bottom line. So even in the current financial storm, they're offering on-site fitness classes and massage, reimbursements for gym memberships and ski passes, flexible hours, amazing travel benefits, and opportunities for on-the-clock community service." For proof, take a look at Brian's online album that captures a few breathtaking moments on Mt. Rainier. Brian Morgan, CEO of Adventure Life, shares the secrets of his health and fitness success. The Weather Channel highlights our Cordillera Blanca Backcountry Trek trip -- originally featured in the St. Louis Post-Dispatch. Every Thursday I write about place I'd love to visit, if I had the time and the money. I just got an email from Adventure Life that has me drooling over a new 14-day northern Peru backcountry trekking tour. For many the Falklands will always conjure up images of war, but today they are increasingly a venue for tourism. You can stay in friendly B&Bs, walk in the unspoilt wilderness and immerse yourself in the local culture. Then jump on board an eight-seater plane to explore neighbouring islands where, if you're lucky, you may encounter penguins, sea lions and orcas. ...AL Voyages offers two trips with similar itineraries named "North African Mediterranean Coast Through the Centuries" on the 114-passenger, all-suite Corinthian II. Both 18-day trips originate in Cairo, Egypt and end in Casablanca, Morocco. The tours visit important sites from antiquity such as Roman ruins as well as places that have figured more recently in world history like the World War II battlefields of Tubruq. Leading academics in the fields of archaeology and religion offer tours at the sites as well as on-board lectures. Trip price includes all meals, alcoholic beverages and land excursions. 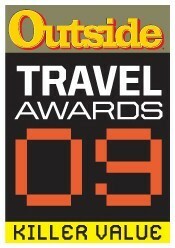 Adventure Life is very pleased to have our Patagonia Wildlife Safari trip chosen as one of Outside Magazine's Best Trips for 2009. Recognized for its great itinerary and 'killer value' ... we couldn't agree more. Situated on the east side of Torres del Paine National Park, Adventure Life's new EcoCamp—a series of wind-powered, fireplace-equipped domes—is your launchpad for four days of guided treks. Highlight: an 11-mile round-trip to the glacial lagoon at the base of the granite towers of Los Torres. Bonus highlight: Colchagua Valley cabernet back at the dining dome. Trips leave between October and April. 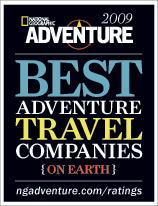 Adventure Life is thrilled to be once again selected by National Geographic Adventure as one of the select "Best Adventure Travel Companies On Earth!" For the second time in as many years, we've conducted an unprecedented survey of adventure travel companies, based on the idea that a traveler’s most important decision is not always where to go but who to go with. 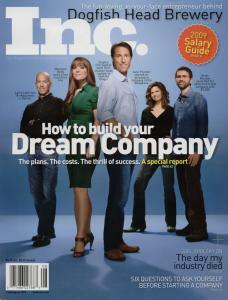 For the 2009 edition, we spoke to more guide services—and their clients—than ever before. Finally, outfitters are getting creative with their Peru itineraries. Latin American specialist Adventure Life, for one, leads a multisport trip from Cuzco to Machu Picchu. American, Continental, and Delta have the most one-stop flights to Lima. When you arrive, check into Hotel Carmel in coastal Mira Flores. DAY 2: Fly to Cuzco, which sits at more than 11,000 feet, and spend the day acclimating. DAYS 3-7: The next five days are an adrenaline-fueled journey to Machu Picchu that includes hiking, whitewater rafting the Urubamba River, and a screaming mountain-bike descent from a 14,000-foot pass into a rainforest. DAYS 8-11: See Machu Picchu, soak in hot springs in the town of Aguas Calientes [now known as Machu Picchu Pueblo), and kayak Lake Titicaca, exploring its Floating Islands and staying in the homes of indigenous families. The company offers from 20 to 25 percent off its Antarctica, South Georgia, Falkland Islands tours, if booked by June 30, 2009. The departure dates are Dec. 18, Jan. 3, Jan. 29, and Feb. 14. The price for this tour ranges in price from $11,995 to $31,595, depending on the season and type of cabin. Sailing to Antarctica requires strong sea legs. The payoff: a once-in-a-lifetime experience. ...On the third day, our fall through the rabbit hole of the Drake is complete and we are in wonderland. The water calms, and our first iceberg encounter is a half-mile-long, high-walled rectangular platform whose symmetry looks too exact to be real. The sun comes out and sends a silver streak across one side of it. Color returns to people's faces, and to the world around us. Even at a distance, the brilliant blue of packed ice glimmers... 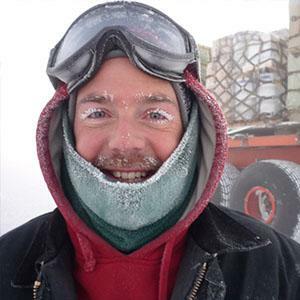 Adventure Life Voyages' 11-day trip on the Antarctic Dream. The travel company encourages its employees to enjoy the experiences that it sells to its clients. ...Adventure Life staff members can select from any of the company’s many destinations, including the Galapagos Islands, Peru, Guatemala, Antarctica and a worldwide expedition cruise. Adventure Life has two featured trips -- our Hiking Galapagos and End of the World adventure -- in the upcoming book published by National Geographic Books as one of the top choices for seasoned travelers! On top of the world: Adventure Life offers a 25-night journey through the Northeast Passage between Alaska and Russia. Clients are taken by icebreaker from Anchorage to Murmansk. Details: Melting of the Arctic attributed to global warming is opening once-frozen routes to exploration, including the so-called Northeast Passage between Alaska and Russia. In this rare outing, the icebreaker Kapitan Khlebnikov will take clients from Anchorage across the top of the world through the Barents Sea to Murmansk. Stops include the uninhabited island of Kolyuchin and the New Siberian Islands, where, weather permitting, passengers will hike the tundra, explore old hunting camps and see the northernmost point of the European continent. ..."Most people hike the W on their own steam, carrying 30-pound packs up vertical boulder fields, pitching tents in gale-force winds and huddling inside makeshift shelters to heat a pot of water to cook dinner. Our group was going it the easy way with Adventure Life, a Montana based outfit that specializes in global outdoor adventures. Instead of being burdened with heavy packs, we carried only light day packs holding our lunch, water and raingear while our trusty guides, Kenneth and Roberto, and two additional female porters, carried the rest..."
"Adventure Life's eight-day Pure Patagonia Base Camp Trekking adventure is an active itinerary of massive glaciers, jagged mountains, glacier hikes and wonderful wildlife. Hiking each day is moderate to strenuous, and participants should be in good shape." 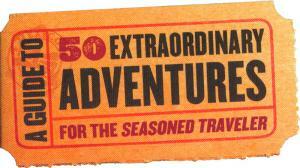 "Adventure Life encourages sustainable, low-impact travel in small groups averaging 8-10 guests. Trip leaders are bilingual and hold university degrees in anthropology, biology, botany and other related disciplines. 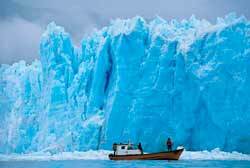 Adventure Life runs several trips in Patagonia and other countries where the wilderness is the star." The Northwest Passage links the Atlantic and Pacific and provides a shipping route between Europe and Asia. The deadly, ice-packed Northwest Passage remained unconquered until Roald Amundsen braved the trip in 1906. Today satellite images suggest that the ice is retreating so rapidly that the passage could be a viable shipping land by 2050, making the Panama Canal nearly obsolete. Following Amundesen's route today (from Anchorage, Alaska, to Resolute Bay, Canaada) aboard an icebreaker with outfitter Adventure Life is more aking to a pleasure cruise. Highlights include passage through the roaring Beaufort Sea and the Victoria Straight, where Amundsen was stranded for two winters. In addition to watching whales, seals, and polar bears, travelers get a look at icebergs that, for now at least, are the size of several city blocks. 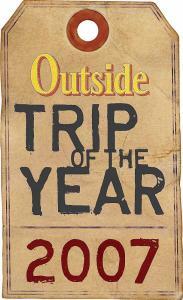 Outside 2007 Trip of the Year: The Worlds 30 Greatest Trips. Ever. Two Years Running! This is the second year in a row an Adventure Life trip has made Outside Magazine's coveted "Trip of the Year." In 2006 our Argentina Northwest Trek made the list - 2007 honors our Hiking Galapagos trip. Explore some of the Islands' most remarkable regions, including snorkeling at Leon Dormido, Tortuga Bay, El Junco Lagoon and a hike to the rim of Sierra Negra volcano. Spend the nights on the Islands in comfortable hotels. This Galapagos tour is a great alternative to the traditional Galapagos cruise. "Straddling the equator 600 miles off the west coast of Ecuador, these far-flung volcanic islands have been the focus of scientists and wildlife lovers since Charles Darwin first scratched his head here in 1835. Now that the Galapagos have become one of the most popular destinations on the planet -- 120,000 yearly vistors come to spy on the islands' famous giant tortoises, fur seals, and blue-footed boobies -- the Galapagos National Park Services keeps tight control on where boat passengers disembark and how long they spend at designated land and underwater visitor sites. The best way to avoid crowds?...Join Adventure Life's new nine-day hiking trip, with overnights in small inns." ...Patagonia: Adventure Life's End of the World trip combines three days on an expedition ship, sailing glacier-fed fjords and corssing the Strait of Magellan, with a land-based exploration of mountainous Chile and Argentina that includes a stay at an eco-tent lodge.